But my real answer usually surprises people. While these pantry staples are important for many dishes, produce is the real heart of the Middle Eastern food I grew up with. And, lucky for me, there is a ton of overlap between Cantonese and Middle Eastern fruits and veggies. As long as I don’t mind packing my suitcase full of my favourite brand of burghul whenever I visit my family, and as long as I don’t mind paying through the nose for a bottle of orange blossom water here and there, I’m perfectly content to wander the wet markets every day like a kid in a candy shop. 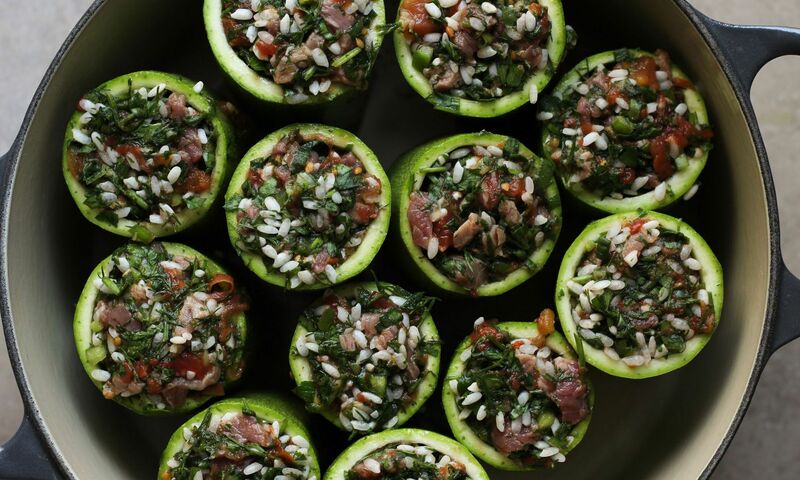 For instance, take one of my favorite dishes: courgette dolma stuffed with beef, rice, herbs, and vegetables, and simmered in a lemony tomato broth. I grew up in the US in an area with a large Middle Eastern population, but this dish turns out to be easier and less expensive to make in Hong Kong. In most generic supermarkets in the US, the only courgette you’ll find are the Italian variety: dark green, long, very narrow, and kind of a pain to core and stuff. When my family makes stuffed courgette dolma, we usually have to settle for the Italian variety or make a trip to a specialty store to find the pale green courgettes we’re more used to, or koosa as we all call them. Here in Hong Kong, Italian courgettes are very expensive, but you can’t go to a market without immediately finding a big stack of koosa. As you can imagine, I ate a lot of courgette dolma the week I learned this. The stuffing in courgette dolma is also beautifully Cantonese-adjacent. As you might expect, I do eat a lot of basmati rice, which is not exactly common in Cantonese cuisine. But when it comes to courgette dolma, many of us actually prefer to stuff the courgette with short or medium grain rice instead. The chubbier little grains hold onto so much moisture and give dolma a wonderful texture, a little like lo mai gai (steamed lotus-wrapped glutinous rice parcels with chicken). I learned how to make this stuffing from my grandmother, who flavors it with piles of coriander leaves, scallions, parsley, and dill. Dill and parsley are a little less accessible here, but scallions and coriander are a wet market staple. In fact, the Sai Ying Pun market by my apartment is known for its generosity with scallions. If you buy a lot of food at a stall and ask for some green onions (or sometimes even if you don’t), they will often just throw them in for free. The flavour of the courgette dolma I make in Hong Kong reflects these subtle differences. It makes me feel at home, rooted in the traditions of my family, but also very much rooted in the place I now call home. I’m all for creatively fusing different culinary traditions, but this is not exactly that kind of fusion cuisine. This is a fusion cuisine that has existed for much longer, and one that we all participate in whenever we move someplace new. We migrate, we take our traditions with us, and we establish new ones. Our food can illustrate a long history of these migrations. It’s no surprise that Asian and Middle Eastern produce would have so much overlap, considering their proximity and trade history. But it also helps us make sense of our own migrations, and gives us an opportunity to enrich our understanding of home and authenticity.